So, I got one of these type things in the mail. Not exactly the same, but similar. My wife hands me the flyer and says, “I think we won a TV!” Below each prize is a number and the number uncovered in the scratch off matches the 4K TV! I’m a skeptical guy, so I read the fine print and I can’t find any gotchas in there. It looks like we really did win the prize. The numbers match, 1:65,000 odds, no purchase necessary, blah blah blah. I take one of my sons with me to the dealer and since we’re there, we talk to a salesman and look at some cars. I found this Subie Outback 3.0R with only 80k on it! I’m not really in the market, but I say I’m interested and give me a price. Oh, I should say that the salesman deftly keeps the prize thing on the back burner until we’re done talking about cars. I actually think I’ve won, and I’m OK checking out cars first. After I say there is no way that I’ll be buying a car today, we walk over to the prize board. 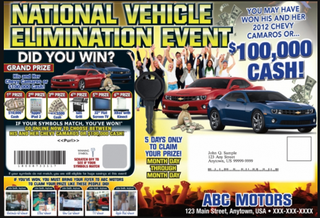 It turns out that the numbers on the flyer below the prizes are just a distraction. “The numbers aren’t associated with the pictures of prizes that happen to be near them.” There is another little number printed near my name and address that has to match a number on the prize board. I won a 5$ gas card. Sneaky bastards. But that’s kind of what I expected from the beginning. And I won’t be buying the Subie, although I would definitely go for something like that down the road.